The Pressure Application Adaptor is used for the teaching or demonstrating of PC or Smartphone Based Data Acquisition. Used with the EMANT300 USB Data Acquisition Module or the EMANT380 Bluetooth Data Acquisition Module, they form a very low cost PC or Smartphone based Manometer. It is ideal for use in hands-on teaching laboratories and projects involving pressure measurements. 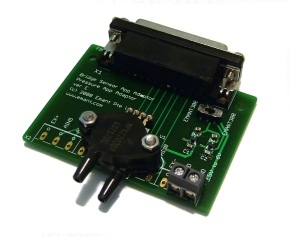 You can use the Bridge Sensor Application Adaptor to connect your absolute pressure sensor to the DAQ modules. The Bridge Sensor application Adaptor is also useful if you need to connect to several pressure sensors. The MPX2202 series device is a silicon piezoresistive pressure sensor that provides a highly accurate and linear voltage output - directly proportional to the applied pressure. The sensor is a single monolithic silicon diaphragm with the strain gage and a thin-film resistor network integrated on-chip. The chip is laser trimmed for precise span and offset calibration and temperature compensation. The differential voltage output of the sensor is directly proportional to the differential pressure applied. The absolute sensor has a built-in reference vacuum. The output voltage will decrease as vacuum, relative to ambient, is drawn on the pressure (P1) side. The output voltage of the differential or gauge sensor increases with increasing pressure applied to the pressure (P1) side relative to the vacuum (P2) side. With a 10V excitation, it measures from 0 TO 200 kPA (0 TO 29 psi) giving a 40 mV full scale span. The output is ratiometric when excited by voltages lower than 10V. In our adaptor design, the sensor is excited at VEXC=3.3V. Since the excitation voltage is 3.3V, the full span output is scaled to 13.33mV. 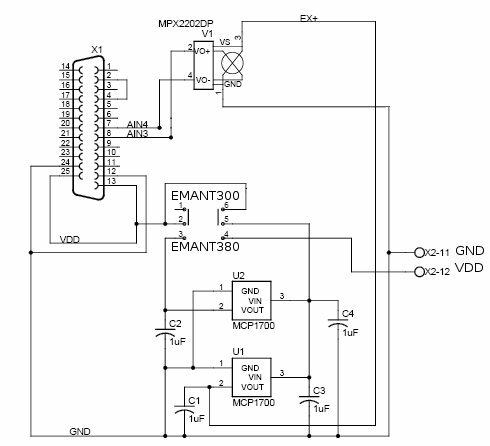 When the input of the EMANT3x0 is set to this range, the module can measure better than 1uV due to its programmable gain amplifier and the resolution of the ADC.